The primate population is being massacred on a huge scale in some of the most fragile and unique habitats on Earth, all to make way for cheap palm oil for unnecessary supermarket products. Palm oil is relatively new phenomenon, only really making a name for itself in the past 20 years or so, but since companies realised how cheap it was to make, there has been no limit to what they will destroy in the name of profits. Palm oil is a cheaper alternative to more wholesome ingredients like olive oil, or coconut oil. It is found in everything from snack foods to shampoo, and perhaps the worst part of the story is that it's not even good for you. It's damaging to the heart every time you eat it or take a shower with it. Areas that have been hit the worst are in Borneo, Sumatra, Indonesia and Malaysia, and the scale of the destruction is terrifying. The forest workers are instructed to clear away EVERYTHING that gets in their path, this includes animal habitats and even the animals themselves. There have been reports of workers running over orangutans with their logging trucks, and orangutan bodies have been found with machete wounds. Due to this deforestation, purely for palm oil, in the last 20 years 90% of orangutan habitat has already been destroyed. If if continues at the same rate, orangutans will be extinct in our lifetimes, in just a few years to be exact. It is hard to imagine that human beings can stand by and see this happening, without acting. There is something you can do, however. 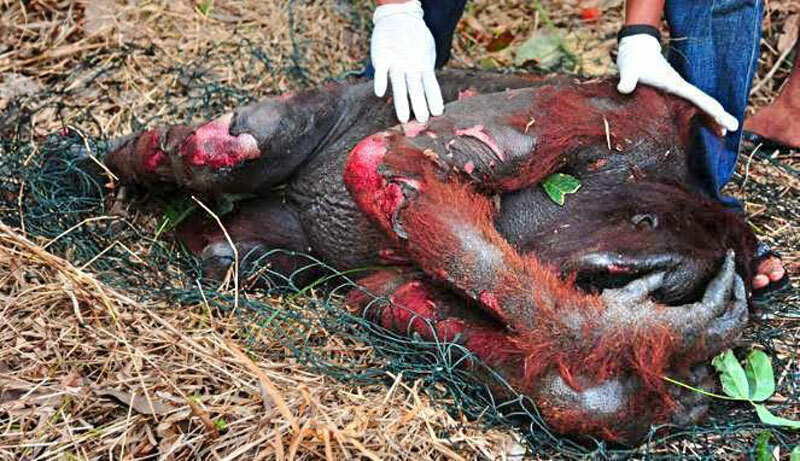 The easiest way to stop this awful process is stop buying things that have palm oil in. In may seem difficult at first, when you realise the extent of how many household products it is in, but if everyone stopped buying palm oil products tomorrow, there would be no industry for it. It really is that simple. You could also write to certain stores you are familiar with and inform them that you will be boycotting their products that contain palm oil. Companies only succeed on the happiness of their customers, and if enough people make their voice heard, they must begin the change to do something about it.